I love making this Rustic Apple Pear Tart. Fall is the time of year when some great apples and pears start to appear. Not far from where we live are sizable apple orchards. In the fall, they have an apple festival called “Apple Hill” that starts just after Labor Day ending on December 31st. As the name implies, it’s all about apples and the fall harvest. That is one of the many reasons I enjoy Fall so much. In my mind, there is nothing better then the wafting aroma of a baking apple tart or pie on a cold, blustery day. I do so love fall for that very reason. So, let’s move on to the recipe. 1 ½ lbs. ½ Granny Smith apples & ½ Pears – peeled, cored and thinly sliced. Preheat oven to 425° F. Line a baking sheet with parchment or Silpat. Prepare the pie dough by rolling it out to a 12 to 13-inch circle. Place the rolled out pie dough on the prepared baking sheet. Note: If you’re using a store bought pie dough, brush the entire top surface of the dough with 1 ½ tablespoons of melted butter. Combine the apple and pear slices, lemon juice, zest, salt, cinnamon, nutmeg, sugar and sifted cornstarch until blended. Carefully place the filling on the pie dough leaving about a 2-inch border for folding. Dot with slivers of remaining butter. 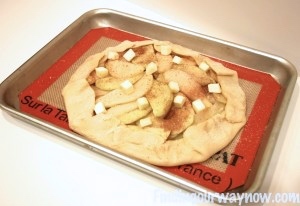 Fold the edges of the dough over the prepared filling, leaving the center uncovered. Brush the folded dough edges with milk and evenly sprinkle with about ½ teaspoon or so of sugar around the folded dough. Pour any leftover juice over the exposed filling. Place the baking sheet with the prepared tart in the center of the oven and bake for 40 to 45 minutes or until golden brown. Allow to cool before serving. Serve with vanilla ice cream, Devonshire Cream or whipped cream. I like to add few small ginger cookies on the side. Notes: Brushing butter on the store bought pie dough is essential. So don’t miss this step. If your rolled out pie dough is smaller then 12 inches reduce the amount of filling accordingly. Any good baking apple or pear varieties will work. Just make sure they’re suited for pies and tarts. 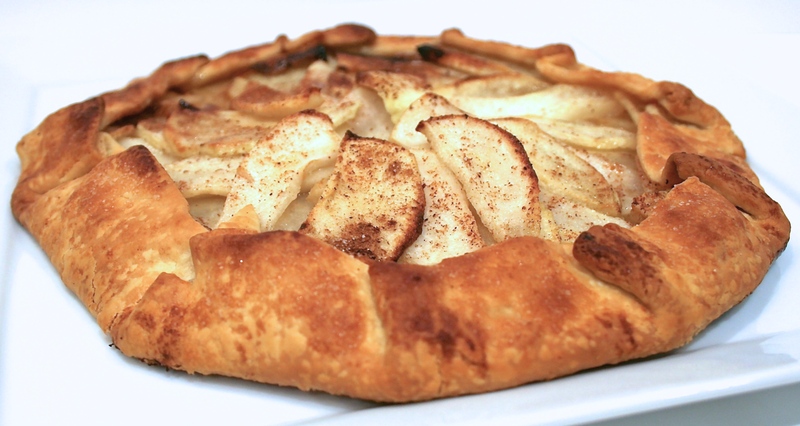 You can also make this tart with just apples, pears, or other fresh fruits of your choice. It works just as well. I’ll often bake the tart for the shortest time, check for doneness and then add time as needed. That’s all there is to it. It’s such a fun recipe to make at the drop of a hat. 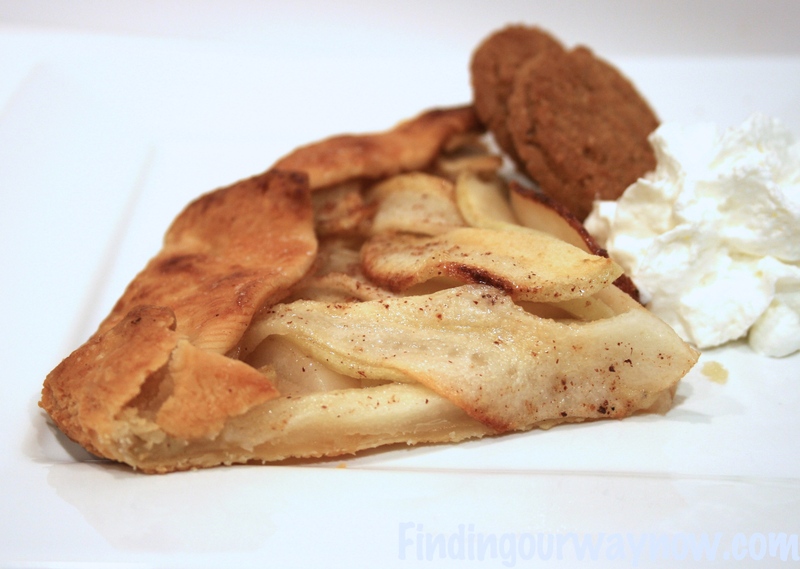 This apple-pear tart is perfect for guests and fun for kids. The aroma of this baking tart alone will persuade you to make this over and over again. Enjoy.